No matter what, it is still a very kind and compassionate world! Every once in a while, people will remind you that they care. And that compassion still thrives in this cold, seemingly hostile, inhuman world. Last evening, Chennai had a non-stop torrential downpour for six hours. This was already a city that was struggling to return to normalcy after last week’s floods – caused by an aggressive North-East monsoon. 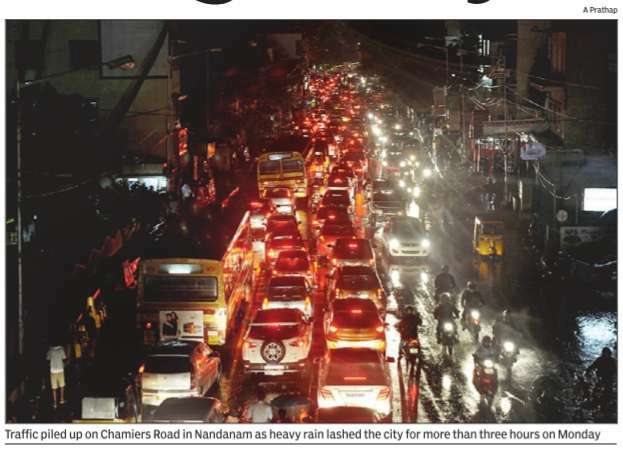 What’s worse, two things that Chennai and Chennaites don’t know how handle are rain and traffic. So, the whole city choked and crawled taking, on an average, 4 hours to move less than 1 km. This, even as it mercilessly pelted from the skies! We had miraculously found ourselves a cab. And had decided to brave – our decision was made much ahead of the rain intensifying – it to attend a bhajan at a friend’s place to celebrate Swami Sathya Sai Baba’s 90thbirthday. This is an annual affair and is a spiritual fellowship that Vaani and I rarely miss. Understandably, we were also stuck in the traffic and rain. As our cab moved a millimeter at a time, we noticed hapless people returning from work, drenched, waiting at bus-stops for buses that probably would never have come last evening. Several people decided to walk, wading through knee-deep, and rising, water. The traffic cops were resilient and were trying to be helpful, despite being soaked under their rain gear, in a literally helpless situation. Everyone was patient though. Not too many people honked with frustration – something that strangely is a practice that we Indians revel in, when we are stuck in traffic snarls. Between looking out the window, chatting occasionally with Vaani and listening to some great Bollywood numbers on Fever 91.9 FM, that the cabbie was kind enough to play, I was checking Facebook – often aimlessly. That’s when this status from a young friend Joe popped up. “Right now on the road, I’ve taken two people into my car. In case any of you have an SUV or any other car capable of wading through knee-deep water in Chennai at this point, now is the time. Go help. ‪#‎helpchennai” I thought this was an awesome and inspiring gesture! It touched me. It took us over 2 hours to cross a 700m distance to reach our destination. Our friend Kumar, and his father Ram, had made elaborate arrangements for the post-bhajan prasad (actually a full dinner spread including steaming idlis, hot sambar, bissibelebath and curd rice) to be served. Several people who were expected at the bhajan that evening could not make it. But several people, passing by, hearing of hot food being served, trooped in. They were welcomed with opens arm and fed personally by Kumar, Ram and their family. I just marveled at the spirit of service that thrived in the moment. A lady who had also made it to the bhajanvenue in an Ola, could not find one to get back home. We discovered she lived in our neighborhood. We offered to drop her back home. It was actually not a drive on the way back; our cab seemed more like a motorized boat and the roads looked like over-flowing canals. We got back home close to midnight and as we went to bed, Vaani and I were both content that, in our own small way, we had been useful. As I scroll through my Facebook Page and catch up on FM and newspaper updates, I just see how many, many people have come together, stepping out of their comfort zones, to help those who need some warmth, some care and love. All this leaves me feeling human, feeling good. Author AVIS ViswanathanPosted on November 24, 2015 March 14, 2016 Categories "Love All, Art of Living, facebook, Fever 91.9 FM, http://schemas.google.com/blogger/2008/kind#post, Inner Peace, Intelligent Living, Serve All", Swami Sathya Sai BabaLeave a comment on No matter what, it is still a very kind and compassionate world!